One of the slightly odd pleasures I had when I was studying at university was learning of various terrible ways people died or executed. To some degree this is normal for many historians but as I majored in amongst others, Mongol history, then it might be clear that I had more deaths than usual to keep my interests up. If each class didn’t have some bizarre and outlandish way that someone died then quite frankly we were all disappointed, even our lecturer. The Mongols had a better repetoire of crazy deaths than anyone I have ever heard of and the others I also studied in the Middle-East also had their moments. Life was never dull and I made notes of every unusual happening all the way through my 4 years of studying. Some of the best I found ways to incorporate into my first novel whilst dozens more are archived away in places around the house I know not where. One day I expect I will happen across them by accident and enjoy re-reading them and enjoying them like others might old diaries or photo albums. However I need not have studied The Mongols and others to witness bizarre deaths and my favourite one ever is quite close to home. This is the unlucky and frankly unlikely death of Sigurd Eysteinsson. Map showing the Orkney islands and the far north-east of Scotland. Sigurd Eysteinsson also known as Sigurd the Mighty was the second Viking earl of Orkney. These remote islands are off the north-east coast of Scotland and like their neighbours The Shetlands are roughtly of the same latitude as Alaska and St. Petersburg and closer to the capitals of 5 other nations than to London itself. Due to their proximity these islands quickly fell victim to the Viking raiders who then went about turning them into Viking strongholds and bases to mount further attacks on Britain and elsewhere. Sigurd Eysteinsson was a leader in the Viking conquest of northern Scotland and they succeeded in conquering the modern day counties of Caithness and Sutherland. It is recorded in the ancient history book the Orkneyinga Saga that Sigurd challenged an indigenous ruler Máel Brigte the Bucktoothed to a 40 man aside battle. With typical Viking treachery, Sigurd brought 80 men instead of 40 and so Máel Brigte the Bucktoothed was defeated in battle and promptly beheaded. Returning in another glorious Viking victory, Sigurd fastened Máels sethered head to his horses saddle and started the ride back north. During the ups and downs of the horse ride back , Máels dangling sethered and bucktoothed head uncontrollably and accidentally bit Sigurds leg. The wound on the leg quickly became infected and inflamed and before he reached home, Sigurd had dead. As unlikely as it was, he had been killed by the head of a dead man and the cheated Máel managed to get his revenge after death. 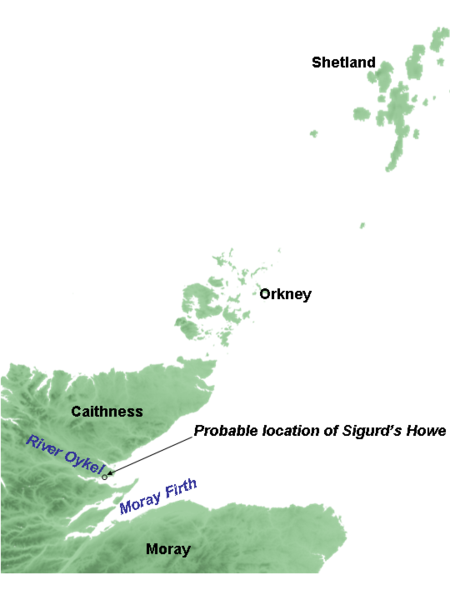 It is thought he was buried at Sigurd Howe near the present day town of Dornoch in Sutherland, Scotland. The Orkneys and their neighbours the Shetlands continued under Viking rule from Norway until they were temporarily granted to the Scottish crown as part of a wedding dowry in 1469. Whenever I hear this historical account, it always makes me laugh. I can’t help but think it serves Sigurd right! This entry was posted in history and tagged Culture, history, Life, Máel Brigte, Orkney, Scotland, Sigurd Eysteinsson, Vikings. Bookmark the permalink. Yes it is. I also don’t think I will have a more bizarre title to a post all year, maybe ever! This is a great, horrific tale. To be killed by the head of dead man, oohh creepy! Hey, thanks so much for stopping by my son’s blog!! He’s enjoying all the traffic. Oh you’re very welcome. It looks like he is going to have a lot of fans very soon! You can always bring it back special for that day. Thanks! I think you’re right. He’s really enjoying it. His stats are higher than mine! Nice post. I was just reading this! The sagas are great. Thank-you. It’s true, they don’t write them like that anymore! I have always thought this was one of the best tales from history, thanks for posting about it. How unlucky could you get – thinking you had gotten the better of your enemy only to have him kill you… AFTER his own death! Yes, I always think this has got to be the most bizarre death ever. Even those Darwin awards can’t beat this. He was so unlucky. I bet the family of the beheaded chieftain had a few drinks when they heard what happened! As someone who studied history myself, I’ve always said it: truth IS stranger than fiction! Great story, thanks for sharing it. It certainly is Emma. If someone gave that idea to a publisher or film studio,they would be laughed out of the office. Thanks for commenting! Yes I agree. If anyone really deserves it, he sure did!